Aren’t They Expensive to Run? Everything is relative, but in the general run of things, no. Fuel consumption is not much greater than current models. A 3.2 litre E320 coupe can easily return over 30mpg, in fact on a high speed run from Cheshire to Aberdeen we achieved 32mpg, including quite a bit of in-town driving. The four cylinder models are more economical still, easily returning MPG figures in the mid thirties on a run. Servicing really is inexpensive, thanks to the availability of mature, factory trained ex-Mercedes dealer technicians, who are now running their own small garages and charging much lower labour rates than the main dealers. An added bonus here is that they are intimately familiar with the older models, and can give a far more personal and friendly service than a main dealer ever could. Apart from scheduled servicing and replacements, the cars consume few spare parts, because they were designed and built to a very high standard in the first place. The parts that are required often cost less than expected. A fact not usually appreciated is that the more exotic Mercedes cars share many of their key components with the bread-and-butter end of the range. This is further helped by the Mercedes-Benz policy of reducing parts prices for cars older than five years, and to continue supplying them virtually for ever. Try walking into a Vauxhall dealer and ordering a part for a 1973 Cavalier. With a Mercedes it will probably be in stock or delivered next day. It is also possible to source parts direct from the firms who make them for Mercedes-Benz, at much lower cost. There is also a large network of third party manufacturers making pattern parts, admittedly to varying levels of quality. For obvious reasons we only recommend sourcing non-safety critical parts by this route. 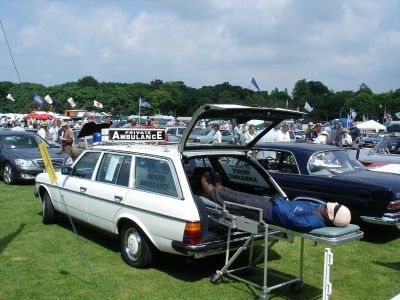 Our own 1980 280TE ambulance on the MB Club stand at the Tatton Park show.